In any case, the following books are half of the books I bought while I was there. 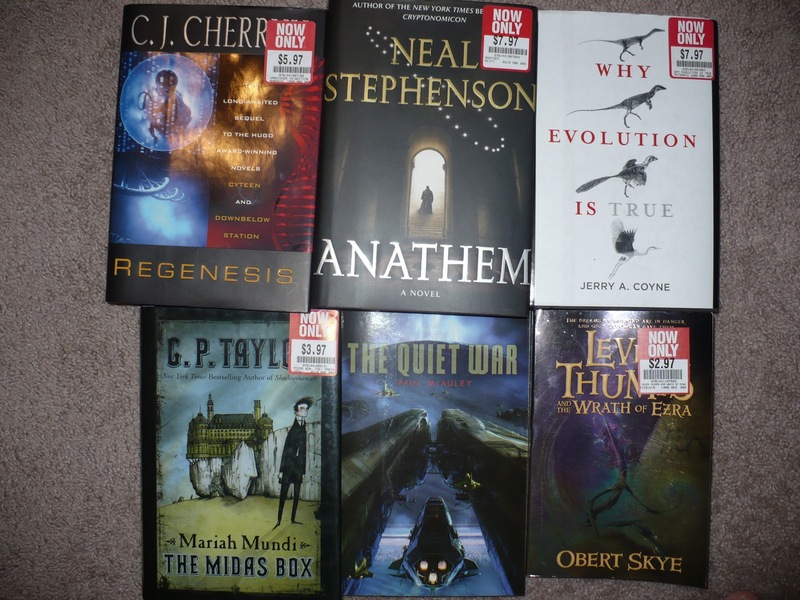 The price tags are not the price I paid for all of these books, though. Coupons are wonderful things! The direct sequel to the Hugo Award- winning novel Cyteen, Regenesis continues the story of Ariane Emory PR, the genetic clone of one of the greatest scientists humanity has ever produced, and of her search for the murderer of her progenitor—the original Ariane Emory. Murder, politics, deception, and genetic and psychological manipulation combine against a backdrop of interstellar human societies at odds to create a mesmerizing and major work in Regenesis. Who did kill the original Ariane Emory? And can her personal replicate avoid the same fate? Those questions have remained unanswered for two decades—since the publication of Cyteen. Now in Regenesis those questions will finally be answered. Anathem, the latest invention by the New York Times bestselling author of Cryptonomicon and The Baroque Cycle, is a magnificent creation: a work of great scope, intelligence, and imagination that ushers readers into a recognizable — yet strangely inverted — world. Fraa Erasmas is a young avout living in the Concent of Saunt Edhar, a sanctuary for mathematicians, scientists, and philosophers, protected from the corrupting influences of the outside “saecular” world by ancient stone, honored traditions, and complex rituals. Over the centuries, cities and governments have risen and fallen beyond the concent’s walls. Three times during history’s darkest epochs violence born of superstition and ignorance has invaded and devastated the cloistered mathic community. Yet the avout have always managed to adapt in the wake of catastrophe, becoming out of necessity even more austere and less dependent on technology and material things. And Erasmas has no fear of the outside — the Extramuros — for the last of the terrible times was long, long ago. Now, in celebration of the week-long, once-in-a-decade rite of Apert, the fraas and suurs prepare to venture beyond the concent’s gates — at the same time opening them wide to welcome the curious “extras” in. During his first Apert as a fraa, Erasmas eagerly anticipates reconnecting with the landmarks and family he hasn’t seen since he was “collected.” But before the week is out, both the existence he abandoned and the one he embraced will stand poised on the brink of cataclysmic change. Powerful unforeseen forces jeopardize the peaceful stability of mathic life and the established ennui of the Extramuros — a threat that only an unsteady alliance of saecular and avout can oppose — as, one by one, Erasmas and his colleagues, teachers, and friends are summoned forth from the safety of the concent in hopes of warding off global disaster. Suddenly burdened with a staggering responsibility, Erasmas finds himself a major player in a drama that will determine the future of his world — as he sets out on an extraordinary odyssey that will carry him to the most dangerous, inhospitable corners of the planet . . . and beyond. In the current debate about creationism and intelligent design, there is an element of the controversy that is rarely mentioned-the evidence. Yet the proof of evolution by natural selection is vast, varied, and magnificent. In this succinct and accessible summary of the facts supporting the theory of natural selection, Jerry A. Coyne dispels common misunderstandings and fears about evolution and clearly confirms the scientific truth that supports this amazing process of change. Weaving together the many threads of modern work in genetics, paleontology, geology, molecular biology, and anatomy that demonstrate the “indelible stamp” of the processes first proposed by Darwin, Why Evolution Is True does not aim to prove creationism wrong. Rather, by using irrefutable evidence, it sets out to prove evolution right. A new spine-tingling adventure by the author of Shadowmancer. The Prince Regent is no ordinary hotel—powered entirely by steam, run by an eccentric inventor who doesn’t believe in sleep, it’s a place full of shadowy characters and dangerous secrets. Mariah has just started working there as a magician’s assistant, and when he and his coworker Sacha unwittingly learn more than they were meant to know, they suddenly find themselves pawns in an evil plot so full of twists and turns that even the labyrinth of hidden tunnels and caverns beneath the hotel can’t contain it. As they struggle to unravel the mystery and stay alive in the process, encountering secret rooms, enchanted objects and vicious mythical creatures, they question whom to trust. All the adults—even the ones offering help—seem to be hiding something. After all, Mariah only got his job because his predecessor vanished one night—and, as Mariah is fast realizing, not all magic tricks are illusions. The dreams of mankind are in grave danger. The Dearth, the true evil beneath the soil, rises above ground and gains the strength he needs to defeat Leven Thumps. Lev, now the Want, is also gaining strength and must discover his new power before the Dearth finds him. Meanwhile, Sycophant Run is on the brink of war, and the secret of the sycophants’ vulnerability is more of a threat than ever — can Clover and the sycophants protect the only gateway to Reality? And speaking of Reality, Terry and Addy are about to join forces with a onetime janitor and the angriest, most confused toothpick alive: Ezra. What kind of power is raging inside that sliver of wood? And there you go! Have you read any of these books? If not, do any of them sound interesting to you? Do I hear Anathem book club? We need the mutual support to get through it.